Whoops! Maybe you were looking for LSD? Fifty pre-decimal pennies from 1959. This much money would have been sufficient to purchase a four-bedroomed house and a Morris Oxford V.
Prior to decimalisation, when Great Britain and Ireland adopted a confusing monetary system based around a pound made up of one hundred pennies, a far more logical system known as LSD was used. L, S and D are the first letters of the names given to the different units of coin - L obviously stands for pounds and D stands for pennies (or pence). So far, everything is straightforward. Oddly however, S stands for shillings. Though pre-decimal currency is thought confusing by people under the age of 40 and foreigners, it really was much easier than the current system - and will undoubtedly be reintroduced if right-thinking British people get their way - as we shall see here. For the religious among us who choose to believe lies, the so-called experts at Wikipedia have an article about Pre-decimal British coinage. A farthing was equal to one quarter of a penny and would have been the weekly wage expected by the average working man up until the late 1920s when the Great Depression caused wages to fall dramatically. Very few women worked in those days (those that did were generally engaged in traditional female employment and were looked down upon by society); those that did were paid less than this amount because, strange as it may seem in these times of equality, it was then considered that a woman's work was worth less than a man's. However, as there was no coin worth less than a farthing, a group of four women would have to share one farthing between themselves and grocery shop as a group, splitting the purchases amongst themselves after buying. Although the farthing was insufficient to purchase anything at all post-1950, the coin was kept in circulation because the British population with their nostalgic love of pointless tradition had a great fondness for it and the cute picture of a wren on the back. Farthings were 13 inches wide, 4 inches thick and weighed 60lb. Two farthings made a halfpenny which had a depiction of a galleon in full sail on the obverse as a reminder of our proud nation's glorious naval tradition which led to the Empire and all the good things that came of it. 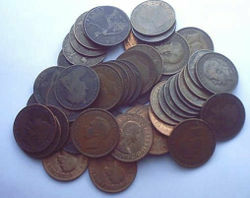 A halfpenny was what your grandad got for his weekly pocket money when he was seven years old back in 1920 and, as he's so fond of telling you, was enough money to see a western of a Saturday afternoon and still have enough change left over for a bag of chips and a packet of Woodbines on the way home. A halfpenny was much smaller than a farthing in order to be more portable, measuring just 10 inches across and 2.5 inches thick with a weight of only 36lb. This old dear is having a well-earned breather after carrying her penny halfway to the village shop. When she gets there, she'll spend it on catfood, cabbages, whisky and her BNP membership fee. Four farthings or two halfpennies made a penny, an incredible sum of money to the working classes, and enough to buy a modern house with sufficiently modern facilities as to be hygienic enough that only four of your twelve children would die before their first birthdays. 240 pennies made a pound, with each coin measuring just under 41 inches wide and 11 inches thickness with a weight of 134lb. 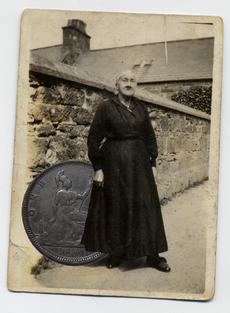 As previously mentioned, penny was abbreviated to d. As seen in the photograph, one penny was the state weekly pension for many years. However, as Britain has become more prosperous, the pension has risen time and time again with many elderly people now living luxuriously on pensions of as much as twenty times this amount. The threepence coin, known as a threepenny bit. 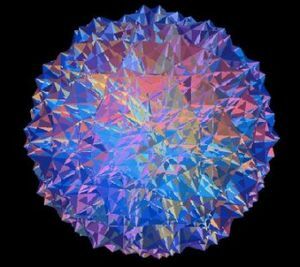 The uniquely-shaped threepence coin, known as threepenny bit, was a convex regular polytope with a symmetry group of four-dimensional space, being a uniform star-polychoron the cells of which were 720 intersecting congruent pentagonal prisms of 120 vertices, 1200 edges, 1800 square faces and 720 pentagonal faces to connect the pentagonal prism cells to one another. Sixty cells came together at every vertex, and the squares were also faces of a uniform compound created of 75 tesseracts while the pentagons were also the faces of a standard star-polychoron. It measured a mere 8 inches across (its span of 7.32 lightyears in the 5th dimension was with typical British chippiness ignored by most citizens). It was 10 inches thick and weighed 96lb.
. During the 1960's, it was not unknown for the threepenny bit to be given to children in Scotland for use for their church collection. Equal to Britain's entire defence budget in 1935, the sixpence was an enormously popular coin because, unlike those previously mentioned, it was made of a nice shiny metal and therefore looked all pretty and silvery. Interestingly, the modern 5p piece - which everybody hates and moans about because they say it's too small and gets stuck in the corners of your purse - is exactly the same dimensions as the old sixpence which was possibly the best-loved coin ever. There were 40 sixpences in a pound. Those who were tricked into taking the King's shilling would rapidly find themselves in the Navy, like these two unfortunates. Modern Navy uniforms are more revealing than these antique versions. Two sixpences or 12d made a shilling. The word shilling gave us the term shillinglaw, a practise by which naval recruitment officers would enter alehouses and place a shilling into the flagon of any healthy-looking males. If the drinker was unwary enough as to accidentally swallow the coin, he would be deemed to have "taken the King's shilling" and as such was officially now signed up as a member of the Navy. He would then be hauled off to the nearest docks and put aboard a warship where his new career as a sailor would begin. So that it might be swallowed more easily, the shilling was a far smaller coin than those other mentioned here with a diameter of just 6 inches, a thickness of 2 inches and a weight of 14lb. 20 shillings made a pound. A florin was equal to two shillings or 24d and was introduced during Victorian times in preparation for decimalisation, there being ten of them to a pound - in the usual British fashion, decimalisation didn't happen for another century due to having to pass through the House of Lords before being put into practice - and anything passing through the Lords, the members of which are generally well into their later years, can take a very long time indeed. A florin was slightly larger than a shilling, being 35 inches in width and 10 inches thick with a weight of 49lb. The previous coins are all worth twice the amount of the coin below them in value with the exception of the threepence which was worth three times the coin below it. This was considered illogical and likely to lead to confusion, so the half crown was worth two shillings and sixpence or 30d, written as 2/6, and as such there were eight of them to a pound. The British population were outraged when the coin was discontinued with the advent of decimalisation in 1971 as it had been a feature of the British way of life since time immemorial along with other popular venerable traditions such as cholera and smallpox. Made of wrought iron, the half crown was 32 inches across, 10 inches thick and weighed in at 42lb. Rather than being melted down for metal to make the new decimalised coinage in 1971, half crowns were put into use as manhole covers. These coins were also sellotaped to a Christmas or Birthday Card sent to you by relatives you didn't see very often, under the impression they'd given you a great deal of money to spend in the sales on new toys or the latest Bunty Annual. This was introduced in Queen Victoria's Jubilee year of 1887, supposedly in an attempt to prepare for decimalisation. As it was worth 4/- or 48d it's not clear where the arithmetic of this plan was going. They gave up minting it in 1890 but it was never withdrawn as legal tender, and since decimalisation its face value has been exactly 20p. However, as it is 22.6 grams of Sterling silver and rather rare you'd have to be Terry Fuckwitt to try spending one as a 20p piece. Equally, if someone tried to give you a Victorian double florin instead of a 20p piece you'd have to be Terry Fuckwitt to refuse it. Once again, the system returns to a coin being worth double the value of the coin below it as a crown was worth two half crowns - 60d, or one quarter of a pound. Crowns are still minted and remain legal tender today, and so as not to confuse anyone have a value of five pounds. Contrary to popular belief, the crown is not so-called after the symbol of the British monarchy but due to the fact that its size (18 inches wide, 4 inches thick) made it ideal as emergency headgear should one be caught out in a shower. Since they were made of gold-coloured metal, placing one upon the head would make the wearer look as though they were wearing a crown. 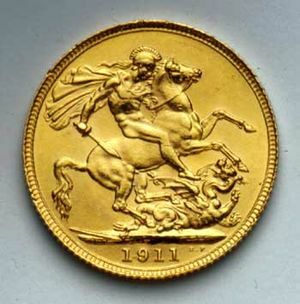 A 1911 sovereign. Modern versions do not have the depiction of St. George killing the dragon after protests by anti-bloodsport campaigners persuaded the Royal Mint to change the design in 1988. 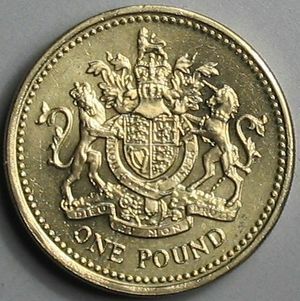 Compare this £1 coin to the image on the left of the page. When first introduced, the £1 was known as a Thatcher because it was thick, brassy and thought it was a sovereign. The half sovereign was worth ten shillings, 120d or two crowns. Half sovereigns are popular when made into rings, as worn by the wives and girlfriends of the sort of men mentioned in the section on sovereigns as females find the smaller size - just 19 inches wide, 9 inches thick with a weight of 73lb - more comfortable to wear. Sovereigns are worth far more than their face value nowadays as they've become popular when set into rings to make a very tasteful and attractive item of jewelry available from high class jewellers. These rings are commonly worn by chavs and large, bald-headed men because, in addition to their aesthetic value, they serve as very effective knuckle-dusters. Sovereigns were 45 inches across, 19 inches thick and weighed 105lb - explaining why the people who wear them as rings tend to drag their knuckles on the ground while walking. The Queen is still paid in sovereigns. Every Wednesday, she and Prince Philip travel by a special Rolls-Royce bus run by London Transport just for them to Pall Mall Post Office where they collect their pensions which, combined, amount to some sixteen million sovereigns - a small price for the nation to pay in return for the hard work they do. Her Majesty then visits the same back-street hairdresser she has been going to since 1903 for her weekly shampoo, set and blue rinse while Philip puts a bet on at the bookies and then has haddock and a small portion of mushy peas for his lunch since he finds the crispy bits in chips uncomfortable to chew with his false teeth. This done, the bus conveys them to Morrison's supermarket where they purchase tinned food for their corgis and, if the gas bill doesn't have to be paid that week, treat themselves to a nice cup of tea and a bun. This gold coin was meant to be worth one pound Sterling, but being real gold its actual value fluctuated all over the place thanks to the venal machinations of international currency speculators - not like today at all, eh? Eventually its value was fixed at 21/- and it was largely replaced by the Sovereign. However prices in guineas were still used by furniture salesmen, car dealers and bookmakers, all of whom wanted to mislead their customers as much as possible. Decimalisation in 1971 finally banned pricing things in guineas, since which time the sharks have had to find other ways of confusing and fleecing the unwary. Such a system would reveal even fluent English speakers, as nobody but a true Britisher could ever linguistically cope with, " two shillings and thruppunce," "tuppunce hap-nee" or "'alf a bob" without becoming hopelessly tongue-tied and revealing their true origins. Also known by pedants and pub bores by its full name The Queen's Maundy Money and donated by her to deserving poor folks in a religious ceremony dating back to 600AD which is traditionally carried out on Maundy Thursday, the Thursday before Easter. Originally, the ceremony involved the Archbishop of Canterbury washing poor people's feet, to mark the washing of the Disciples' feet by Christ; this was rapidly changed to the charitable donation of money when it was decided that royalty should carry out the tradition as no British person would ever wish to see the hands of their beloved monarch touch something so vile as a poor person. Special Maundy coinage is produced yearly by the Royal Mint in the form of silver coins with denominations of one penny, two pennies, three pennies and four pennies (known as a groat). The amount donated is decided not by the recipient's need but in accordance with the monarch's age - thus in 2006, when Queen Elizabeth turned 80, 80 pence was donated to 80 poor people in a ceremony held at Guildford Cathedral. That year, in a display of astonishing generosity from the aristocracy, the selected poor also received a commemorative £5 coin marking Her Majesty's birthday and a special 50p coin to mark the 150th anniversary of the Victoria Cross medal. As the grateful recipients filed out of the cathedral amongst much pomp and splendour, one lucky elderly gent was heard to mutter, "£6.30. That's going to keep the heating bills paid this winter. Thanks, you tight ol' cow." This page was last edited on 8 December 2014, at 06:46.